It was great to attend the opening of the new Dawurr boarding facility at Nhulunbuy High school. The opening was the culmination of over two years of work by stakeholders and the local steering committee who were instrumental in the development of building design, policies, student wellbeing processes and recruitment of staff. The value of this local decision making cannot be overstated and it was very evident as I met the young people who board there, how well this facility and the staff meet their needs and how proud the young residents are of their new home away from home. Recently I have had the opportunity to explore the new online induction courses for staff that have been developed as part of the strategy and I am very impressed with the comprehensiveness of the courses and their usability. I am looking forward to the formal launch of these in Term 3. Consultations regarding the IES stage two implementation plan have progressed and a draft report will be submitted to our Executive Board for consideration. The final report and the information provided by the external evaluation will drive the key actions for the 2018-2020 strategy. Term 3 will be busy with our negotiations with the Australian Government on stage two and will see the final cycle of the roll out of Literacy and Numeracy Essentials, Employment Pathways and Social and Emotional Learning. 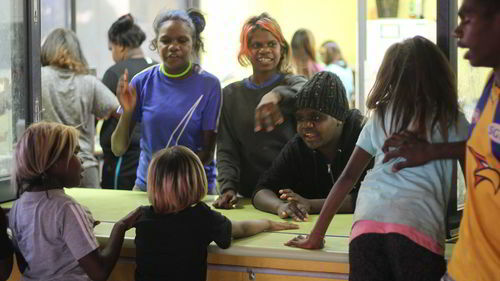 Students at Papunya School northwest of Alice Springs held their first Employment Pathways event this term, learning skills to help increase their employability. Working with the VET trainer, boys from Years 9 and 10 built a giant movie screen using whitecote hardboard, and put it on wheels so it can be used for other occasions such as the Christmas concert. The baking team spent the three days leading up to the event making rainbow and chocolate cakes, as well as lamingtons, cookies and ice cream, while others learnt how to make coffee using the school’s new barista machine. The advertising team created posters and an ad for CAAMA radio. Each student had a turn selling their products and learnt skills including how to work as part of a team, how to budget and give the correct change. The school is already looking forward to next term’s event when they plan to sell bush medicine made by the students themselves, and products using the school’s new sewing machine. Employment Pathways is a model of secondary education designed to meet the needs of Indigenous students from remote communities. It aims to better equip students with access to employment opportunities beyond school by developing students’ literacy and numeracy, life and employability skills. Employment Pathways began implementing in 11 schools across the Territory in 2016. This year, Employment Pathways will be operating in an additional 30 schools. A proud community gathered in Week 2 of Term 2 to celebrate the completion of Certificate I and Certificate II in Conservation and Land Management at Maningrida College. The graduation by 19 senior students was the culmination of up to two years of study, commitment and hard work. The certificate courses are facilitated in conjunction with Charles Darwin University and are part of a pathway to employment with the local ranger program. 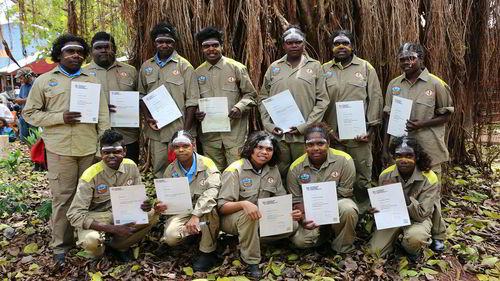 Maningrida College is the very first remote NT school to have students complete a Certificate II course in conjunction with Charles Darwin University. In the program, students gain experience working with local rangers to manage the environment of the local area. Tasks include supporting natural area restoration projects, cultivating and planting local flora, land management through prescribed burning as well as conducing bio-diversity studies to support land management of the area into the future. The whole school stopped and came to be a part of the event. More than 100 members of the local community attended the event, proud of the achievements of these young future leaders of the community. Other distinguished guests included the Hon Senator Nigel Scullion, Federal Minister of Indigenous Affairs, and the Hon Warren Snowdon MP, Federal Minister for Lingiari, as well as Djelk rangers’ manager, Ricky Archer. Ricky Archer spoke about the work ethic and the drive displayed by the students. He said he wished he could offer them all a job at the end of their studies and encouraged other local businesses to consider these young people carefully when hiring in the future. This sentiment was echoed by the Hon Senator Nigel Scullion who spoke of the need for Indigenous communities to train young local people to look after their land and manage their communities into the future. Families as First Teacher (FaFT) continues to expand with communities in Jilkminggan and Mataranka opening FaFT programs in Term 2 of this year. Families as First Teachers provides a quality early childhood program aimed at giving young children the best possible start in life. The program targets young children in the early years and their families and aims to enhance the learning and developmental outcomes for remote Indigenous children. 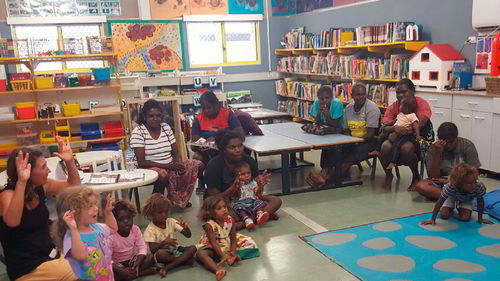 FaFT continues to achieve successful outcomes for children, their families and the community and is currently operating in 32 remote and urban communities. By the end of this year, there will be 38 FaFT programs. FaFT is expanding to five urban sites, based at Ludmilla Primary School, Early Intervention Learning Hub (old Henbury School), Palmerston Child and Family Centre, Larapinta Child and Family Centre and MacFarlane Primary School. The innovative Wulagi Primary School runs a school initiated playgroup using the FaFT program model. A FaFT logo is currently being developed and will be used to promote all FaFT resources and materials including posters, brochures and banners. All FaFT sites will have the opportunity to grow their own FaFT identity by adding their own images and information in order to promote the FaFT program within their communities. Nhulunbuy Boarding Facility was officially opened on Tuesday 23 May and named Dawurr by Traditional Owners, the Rirratjingu clan. Dawurr is the name of honey (guku), which comes from the flower of the stringybark tree. It symbolises children growing and developing as they travel through schooling, and is central to a significant story and song lines of Nhulunbuy. There are currently 34 students from remote communities and homelands who stay at Dawurr and attend Nhulunbuy High School. 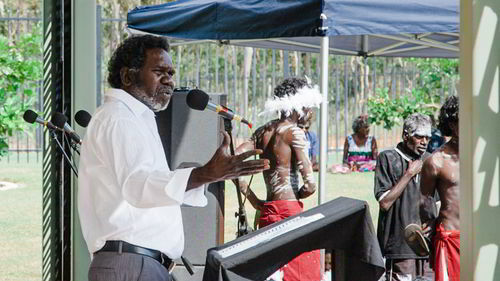 Two years of extensive consultation has ensured the Yolngu community has been involved every step of the way. Boarding students stay with family groups, and if they get homesick, there is room for relatives to stay for short periods. Dawurr is part of the Indigenous Education Strategy to provide students and their parents in remote Aboriginal communities with more choice for secondary schooling. A new database is streamlining the way our Transition Support Unit can support students transitioning into boarding school. The new system, called BoardingNT, ensures all information for a student is kept in the one place, allowing staff to better support students and their families as they consider transitioning to boarding school. Everything from consent forms, birth certificates, applications for ABSTUDY, and enrolment forms is now stored in the one place. 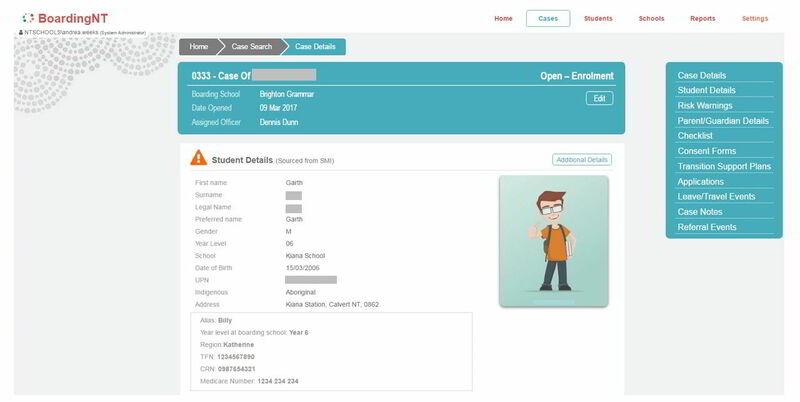 Student and Family Support Officers (SASFO) and Transition Support Officers (TSO) have access to the case management system, which is designed to simplify the record keeping process. If families do not have specific records, such as a birth certificate, consent can be given to SAFSOs and TSOs to complete all the information. The Transition Support Unit has been operating since October 2015 and is working with families, schools and students to ensure students are prepared for and enrolled in appropriate schooling options in the secondary years, including away from home education options. For more information, please contact Andrea Weeks, Information and Reporting Project Officer, at andrea.weeks@nt.gov.au. Literacy and Numeracy Essentials (LANE) has moved into its implementation phase with 38 schools expected to be implementing one or more components of LANE by the end of this semester. In addition, there are 26 schools preparing for implementation in Semester 2. LANE is a whole school approach to literacy and numeracy, recommended for remote and very remote schools across the NT. In 2016, 13 schools across the Northern Territory trialled the program, with positive feedback received. One of those trial schools was Belyuen School in the Palmerston and Rural Region (PARR). Under the leadership of the teaching principal Renee Buckingham, Belyuen School has engaged with all available components of LANE and are now beginning to demonstrate improved student outcomes. In particular, the school is celebrating significant improvements in Phonics using the LANE recommended resource, Read Write Inc.
Belyuen School is not alone in its success, with many schools now beginning to see significant improvements in student outcomes since the implementation of LANE. Schools are able to use the LANE program and resources in the way that best suits their needs to develop students’ knowledge and understanding of literacy and numeracy through a variety of high quality, evidence based resources. Several training days are being run in Term 2 across the NT to allow teachers from all regions to participate. There are a number of ways to begin implementing a whole school approach to literacy and numeracy using the LANE resources. Trainers are working one on one with schools to help each school tailor their program. Your Regional Manager will be able to discuss the benefits of LANE for your school and ensure you receive the support you need to successfully implement LANE as a school-wide approach. All LANE resources are available on Learning Links. For more information, please contact Rebecca Campbell, LANE Implementation Manager at rebecca.campbell@nt.gov.au or your regional Learning and Performance Network Leader. Email the Indigenous Education Review Implementation Team ierinews.doe@nt.gov.au or phone 08 8944 9365.